In the early 1950s, a consortium of British Columbia wood products manufacturers sponsored a series of 11 promotional Trend Houses in major centres across Canada. Architect-designed and intended to showcase the innovative and expressive use of B.C. woods and wood products, the houses were open to the public for four months before their new owners moved in. 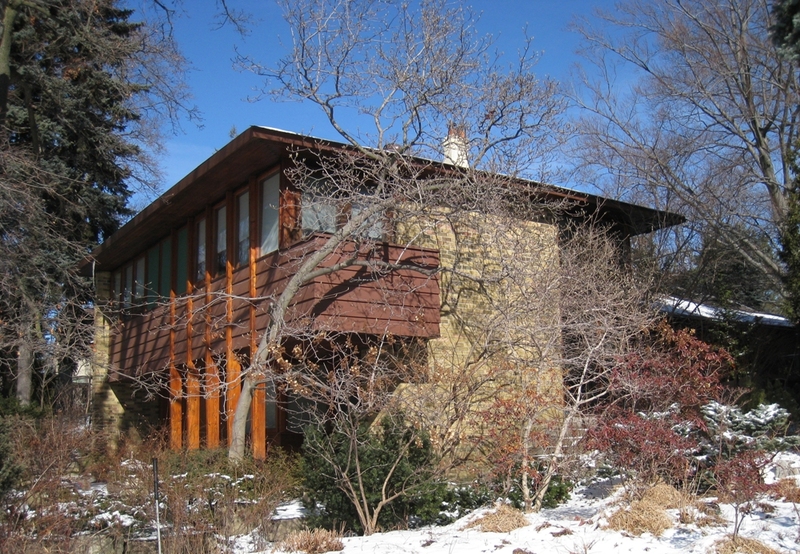 The Toronto Trend House was designed by Eric Arthur of Fleury, Arthur & Calvert for his own use and completed in 1954. Located at 41 Weybourne Crescent in leafy Lawrence Park, the L-shaped, split-level design is deftly set into its triangular upward-sloping site, the former garden of a neighbouring house. Western Red Cedar is featured as the primary building material inside and out, offset by large expanses of glass and ochre brick walls, terraces and planters. Within the two-storey section facing the street, Arthur arranged three bedrooms and a small cantilevered balcony above the garage, study and main entrance. Once inside, a glass-walled staircase leads upward to the living and dining area. Secluded from the street, this intimate hideaway focuses upon a long brick fireplace wall and is sheltered by a broad hipped roof lined with overlapping cedar planks. The room opens through French doors onto landscaped terraces, where a canopy of deciduous trees screens the summer sun while allowing natural light during winter. In 1983, the Toronto Trend House became the first post-WWII residence to be placed on the City of Toronto’s Inventory of Heritage Properties. It remains in immaculate original condition. The Trend House program proved to be a great success. Heavily promoted through Canadian home magazines and local newspapers, the houses drew an estimated 1.2 million visitors during the spring and summer of 1952 (the pilot Trend House in Etobicoke) and 1954. Eric Arthur (1898-1982) is regarded as one of the pivotal figures in Canadian architecture, particularly in the area of heritage conservation. A longtime professor at the University of Toronto’s School of Architecture, Arthur was a founding member of the Architectural Conservancy of Ontario and led efforts to preserve many historic Toronto buildings, including Union Station, St. Lawrence Hall and Old City Hall. He also spearheaded the international competition that led to Viljo Revell’s radical New City Hall. His many writings include the seminal 1964 book Toronto: No Mean City. For more information on the Trend Houses, see the website of Michael Kurtz, owner of the Calgary Trend House. There’s also a chapter about the ill-fated Etobicoke Trend House in the 2007 book Endangered Species, available through Dominion Modern. The Montreal house is threatened with demolition.